NASA Chief Scientist Jim Green discusses NASA's InSight mission during a prelaunch media briefing, Thursday, May 3, 2018, at Vandenberg Air Force Base in California. VANDENBERG AIR FORCE BASE, Calif. — NASA's next Mars-bound spacecraft is ready to launch — even if there is a better than likely chance that no one will be able to see it when it leaves the ground. 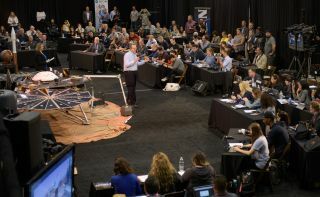 Space agency officials on Thursday (May 3) gave their approval to launch InSight, the first-ever mission to study the deep interior of the Red Planet. "We got 'go's' from all aspects, all organizations that have a vested interest in launching InSight," Dunn said. "And so, we are go for launch." The robotic lander is scheduled to lift off Saturday (May 5) at 4:05 a.m. PDT (7:05 a.m. EDT or 1105 GMT) atop a United Launch Alliance Atlas V rocket from a pad here at Vandenberg, in southern California. The local weather is forecast to support an on-time launch — with the one exception of visibility. "We are anticipating visibility to be bad that day," said 1st Lt. Kristina Williams, weather officer for the U.S. Air Force's 30th Space Wing at Vandenberg. Col. Michael Hough, Commander 30th Space Wing, Vandenberg Air Force Base, left, and 1st Lieutenant Kristina Williams, weather officer, 30th Space Wing, Vandenberg Air Force Base, discuss NASA's InSight mission during a prelaunch media briefing, Thursday, May 3, 2018, at Vandenberg Air Force Base in California. As of Thursday morning, there was an 80 percent chance of the marine fog layer exceeding the normal visibility requirements for a safe launch. "There is an 80 percent chance that we will have visibility that low and you will not be able to see the launch," said Williams. "However, for the launch to actually happen, we are anticipating for all other mandatory range safety and user constraints that probability of violation is zero percent." Range safety, which monitors launches to make sure they pose no threat to people or property in the area, has the ability to "mitigate" the visibility constraint, Williams explained. "If they choose to do so, we may be able to not have to even monitor that constraint during the launch, in which case, yes, you will not be able to see the launch, but the launch could be successful and not be impacted by weather," she said. Whether or not it is seen when it lifts off, InSight (short for Interior Exploration using Seismic Investigations, Geodesy and Heat Transport) will become NASA's first interplanetary mission to launch from the United States' west coast. "We're finally breaking the monopoly that the east coast has had, that Floridians have had, on interplanetary launches," said Tom Hoffman, InSight project manager at NASA's Jet Propulsion Laboratory in Pasadena, California. The countdown to the launch of InSight is scheduled to start on Friday (May 4) at 10:14 p.m. PDT (1:14 a.m. EDT or 0514 GMT on Saturday, May 5). A little over an hour later, the 260-foot-tall (80 meters) Mobile Service Tower protecting the Atlas V will begin a 20-minute long, 250-foot (about 80 m) roll away from the rocket. Four hours and 25 minutes later, the two-hour launch window will open. InSight is scheduled to land on Mars on Nov. 26, after a 205-day, 301-million-mile (485 million kilometers) journey. The lander's instruments include a seismometer to try to detect marsquakes and a self-hammering probe that will monitor the flow of heat from the planet's interior. Launching alongside InSight and trailing it to Mars will be two small spacecraft designed to test deep-space communications and relay data from InSight as it enters the Martian atmosphere. The Mars Cube One, or MarCO, duo will be the first cubesats launched to another planet. "This is really a fantastic mission," said Jim Green, NASA's newly appointed Chief Scientist. "It is a planetary mission from the Discovery program. The Discovery program is all about doing firsts and getting to places have never been before." "That enables us to be in the position we are now in, with a spacecraft sitting on top of an Atlas ready to go to Mars, and everything is in top shape," he said.